This shawl/scarf is absolutely beautiful. I think it looks better in red than the one on the pattern ad. 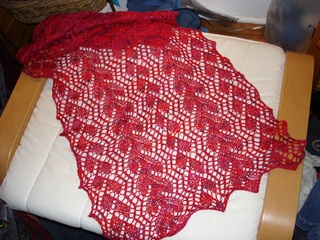 Looking at this made me decide to buy my SP4 (who loves red) some of this yarn and this pattern. I'm going to send her here to see the finished item. Hope you don't mind! Gorgeous!Yet another project to add to the TO DO list.